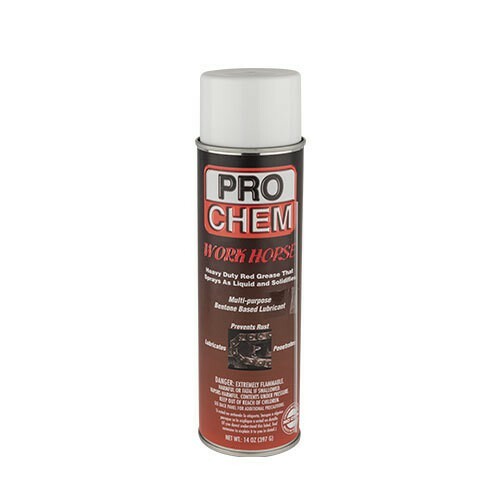 WORK HORSE | Pro Chem, Inc.
WORK HORSE is a multipurpose, bentone-based, heavy-duty penetrant lubricant that soaks into hard-to-reach areas for tough, long lasting grease protection. Product sprays out as thick liquid, which transforms into a heavy-duty, nonmelting grease. Cured lubricant withstands heat to 550°F, moisture, acids and high pressure. A high-pressure additive reduces wear and prolongs operational life of all machinery. Prevents seizing of threads and loosens frozen parts. Shake well before using to ensure proper mixing. Spray a thin film on the surface to be lubricated or protected. To apply to hard to reach areas, insert the extension tube provided into the valve cap. A thickened grease will form within seconds after application, and will be fully cured within minutes.